Despite the widely held belief that bench presses are better, the benefits of push-ups are still extensive. In fact, a push-up by itself is almost always better than a simple bench press. This is primarily because push-ups not only allow you to workout your upper body, but they also work out your core muscles. Whether you are simply trying to lose weight or build muscle, push-ups should always be a part of your workout program. 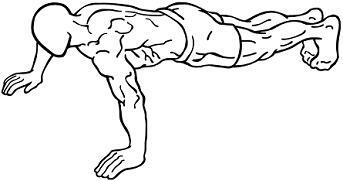 A good push-up has the ability to workout your chest, biceps, triceps, shoulders, abdominals, back, quads, and glutes. It may seem surprising that one simple exercise can potentially target so many muscle groups, but it’s the truth. It’s a great example of a functional exercise. The next time you do a push-up, try to focus on all of the muscles that are contracting. You’ll quickly realize how comprehensive a push-up workout is. Utilizing push-ups in your regular workout routine will help you improve your body’s overall muscular strength and endurance. Below is a great instructional video from Army National Guard Master Fitness Trainer Ken Weichert. In the video he explains the proper technique for doing a perfect push-up. It’s important to keep in mind that there are a number of different push-up variations. These different types of push-ups all have there own advantages. By making slight variations to your form and technique, you are able to target different muscle groups. Keep reading to find out about some of the best techniques for doing push-ups. The classic push-up needs little explanation. This is the standard technique that most gym teachers and coaches teach. It was also demonstrated in the video above. It’s essential know the proper form for the classic push-up since all other variations are based off of it. Balance your body on your toes and the palms of your hands. Make sure your arms are slightly wider than shoulder width. Keep your back straight forming a straight line from your feet to your head. Tighten your glutes and abdominals. Slowly lower your body until your upper arms are parallel to the ground. Push your body back up. This is just a slight variation on the classic push-up. The only difference is your leg placement. Put one of your feet behind the other by crossing your legs. Then continue to do the push-ups using the same technique described above. The 3 point push-ups are designed to add more difficulty to your workout. These push-up variations are designed to specifically target certain muscle groups. An incline push-up will help you focus on your shoulders, while the decline position will target the upper chest muscles. Don’t worry though. Both variations are still working on multiple muscle groups. Incline Push-ups are done by simply placing your hands on a raised object as opposed to the ground. A bench or even a bar will work well. Everything else remains the same. Just remember that the higher the incline, the harder the push-ups will be. For the decline push-ups, you need to put your feet on a raised object. The diagram on the right shows the proper form for a decline push-up. The difficulty is once again based on the height. Both of these variations are achieved simply by adjusting the spacing of your hands. Diamond push-ups are achieved by putting the palms of your hands close to each other, with your index fingers and thumbs forming a diamond shape. This style push-up puts extra emphasis on your triceps workout. The wide push-ups are identical to the classic, but your hands are spaced further apart. This puts extra stress on your pectorals and allows you to get a better chest workout. Hand placement really plays a major part in your workout. As you can see with the diamond and wide push-ups, you can target different muscles groups with the slightest variation in hand placement. This is another slight variation on the classic style. With the plyometric push-up you start out in the classic position and proceed as if you are doing a normal push-up. However, as you are pushing yourself up, you push hard enough so that your hands come off the floor. The goal is to push yourself into the air. As you come back down, you should go right into your next repetition without missing a beat. The push-up is without a doubt one of the best and most versatile exercises you can utilize in your workout. Whether you are focusing on one particular muscle group or many, push-ups will allow you to build the muscular strength and endurance you desire.